“I am Eryan Youssef Saad. I want to wash away your Coptic shame with my Coptic blood.” This was how early 20th-century medical student and political activist Eryan Youssef Saad addressed then prime minister Youssef Wahba, who was interrogating him about his motives in attempting to kill him by throwing a bomb at his motorcade as it passed through Downtown Cairo in 1919. The statement is in the memoirs of Saad, a leading player in the 1919 Revolution. They recall the sense of fury that took over the nation when Wahba accepted the royal request for him to lead the government and meet with British representative Lord Alfred Milner. This, Saad explained in his memoirs, was against the national consensus and had been decried by revolution leader Saad Zaghloul who was in France at the time. It was clear to Saad that Wahba would have to be eliminated. 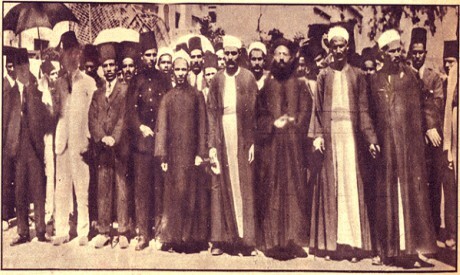 He did not want to see a Muslim undertake this task for fear that it would prompt divisions among Egypt’s Muslims and Copts that had been recently healed with the outbreak of the 1919 Revolution after close to a decade of sensitivities in the wake of the assassination of prime minister Boutros Ghali in February 1910. The latter had been at the hands of activist Ibrahim Al-Wardani, who claimed to be avenging Ghali’s collaboration in the execution of Egyptians who had confronted British soldiers in the famous Denshway incident in 1906. According to historian Mohamed Afifi, this militant side of Coptic political choices in the early decades of the 20th century is too often forgotten, with some assuming that the Coptic political engagement at the time would not have taken a violent path. “This is untrue, however, and it is simply an assumption that people have. The fact of the matter is that in the early decades of the 20th century there were some seven militant political organisations that had joint Muslim and Coptic participation,” Afifi said. He added that the Black Hand group of which Saad was a member was just one of these. “From a strictly demographic point of view, there were more Muslims in these organisations than Copts. But this does not change the fact that Copts were always present,” he said. Afifi is head of the Cairo University Department of History, and in his 1988 PhD he examined the social choices of Copts in the 17th to the 19th centuries before later writing extensively on issues related to Coptic social and political choices including in the 1919 Revolution. He dedicated a book issued in 2001 to the role played by a Coptic priest who made speeches at Al-Azhar in the early days of the revolution. Afifi argues that his research has shown that what could have prompted Saad’s decision to take the life of Wahba might not have been only the episode of Al-Wardani. Afifi acknowledges that there are some historic incidents that could have prompted this sentiment. One incident often used is the support that Yaacoub Hanna, a Copt, offered to the French during their occupation of Egypt in the early 19th century. But this support has been taken out of context, and it must be placed against the background of the history of Coptic grievances during the rule of the Mamelukes in Egypt, he said. It is also often not juxtaposed with the role played by other Coptic figures, including Girgis Al-Gohari, in opposing the French occupation. The Coptic Church also disowned Hanna’s choices, just as a little over a century later it declined to support Wahba as leader of the government and his meeting with Milner. 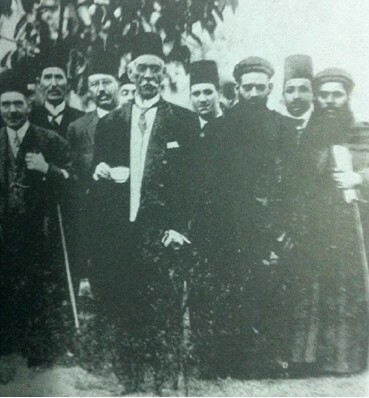 Zaghloul with Christian clergymen and others of the secular orientation: it was he who introduced religious education in schools, raising the slogans “Religion is for God, and Homeland is for All” and “Long live the crescent alongside the cross”. 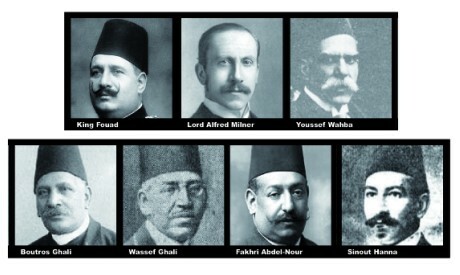 Afifi argues that while the Coptic Conference and the Islamic Conference of 1910, held against the backdrop of tensions in the wake of the assassination of Ghali, were originally designed to champion religious agendas, they eventually turned towards a more consensual nationalist agenda. “This is again evidence that goes against the assumption of the inevitability of Coptic-Muslim strife at moments of political tension,” Afifi said. He added that what had helped to sideline the call of the sectarianism that was trying to find roots in the second decade of the 20th century had been the upsurge of the nationalist movement in the wake of World War I. In his memoirs, Fakhri Abdel-Nour, one of the recognised Coptic faces of the 1919 Revolution, recalls the positive impact of the statement made by Saad Zaghloul at the onset of the “equal responsibilities and equal rights” of Egyptian Copts and Muslims in and after the revolution. From the beginning, Abdel-Nour recalls, Zaghloul was joined by the Copts Wassef Ghali and Morkos Hanna, later chosen as members of the government he formed in a challenge to the then established standard of having one Copt in a 10-member cabinet. Saad Zaghloul was firm about his choices, and he defended them firmly to king Fouad later, Abdel-Nour wrote. His memoirs are also full of incidents of support by Saad Zaghloul for Copts and by Copts for Saad Zaghloul. There was the choice of the Copts in 1921 to go along with Zaghloul’s appeal, with other figures including Wassef Ghali and Sinout Hanna, to abstain from celebrating Easter in sympathy with demonstrators killed by police bullets in the governorate of Gharbiya just days before. There was also Zaghloul’s decision to visit Coptic figures in the Wafd Party on Easter Sunday and to make a statement to mark the day. According to Afifi, some think that unlike some other political leaders of modern Egypt, Zaghloul was particularly successful in his approaches to the Copts. But this is also not necessarily the case, he argues. Many of the choices made by the Copts during the 1919 Revolution were inspired by the fact that like other Egyptians they wished to see an end to the British occupation. “Ultimately, it is the foreign threat that brings all Egyptians together. This was also the case in a different way during the 1973 War,” Afifi said. For this reason, it would be a mistake to compare the position of the Copts during the 1919 Revolution to that during the 25 January Revolution in 2011, he adds. “Of course in 2011 there were Copts right from the beginning in Cairo’s Tahrir Square, and of course we all remember the pictures of Copts and Muslims praying together,” Afifi said. Afifi acknowledges that the political participation of the Copts in 2011 was not as marked as that of 1919 “because the overall participation in 2011 was not similar to that in 1919. “However, there are still people who argue that the Copts hesitated too much in the 25 January Revolution, when in fact much of the population, both Muslims and Copts, hesitated about the revolution,” Afifi said. One wrong assumption is that the Copts retreated from the political scene in 2011 because the church had taken a negative stance on the revolution, he added. There is a need, Afifi said, for more study of Coptic history, “not just the political but also the social and economic.” Often enough, he finds preconceived ideas about Coptic participation in the 1919 Revolution obscure what was in fact their extensive participation before and after the revolution. “The Coptic presence in 1919 was a glorious one, but it has not been fully studied,” Afifi concluded.